One of the top construction groups in the UK, Skanska, is utilising the expertise of Specsavers Corporate Eyecare in a bid to increase road safety among its many drivers. Skanska has been working with road safety charity Brake to promote road safety, but needed specific expertise and knowledge when it came to promoting the importance of regular eyecare. 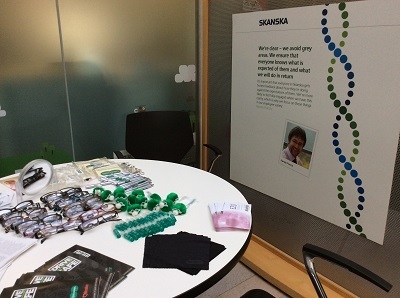 Tracey Bass, Corporate Account Manager for Specsavers Corporate Eyecare, spent two days at Skanska’s offices, offering advice and information relating to driver eyesight. Any Skanska employees who did not perform well in the vision screening, or who gave Tracey reason for concern, were advised to make an appointment with their optometrist as soon as possible, to receive a full eye examination. Skanska is keen to continue its relationship with Specsavers Corporate Eyecare and has already begun discussing how Specsavers can continue to further support its initiatives in 2015. Specsavers Corporate Eyecare has developed Driver Eyecare eVouchers, specifically designed for employees who drive in the course of their work. Premium Club is built into every Diver Eyecare eVoucher and offers a further £20 contribution when glasses are selected from the £99 range or above, thus giving a combined contribution of £65.